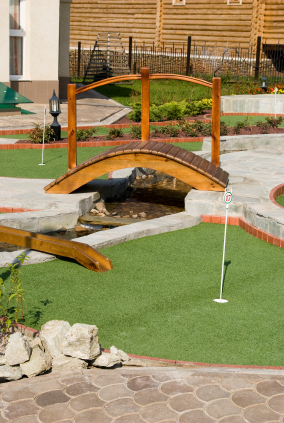 Backyard Putting Greens are a great way to enhance the beauty of your landscape, while saving you the time and expense of landscape maintenance. If you have summer parties, think how much fun your guests will have with some putting and chipping games. The night-time is the right-time! You can add lighted holes and use glow balls for hours of enjoyment. Naturally, you’ll improve your golf game by having the convenience of a practice green just steps away from your patio. We will design your green with an attractive shape, hole positions of your choice, as well as challenging breaks and undulations comparable to real greens.